Hotel operator Marriott International Inc. has decided to make all of its hotels in the United States and Canada smoke-free starting in September. The move announced Wednesday follows an industry trend, said analyst William Crow of Raymond James & Associates. The Westin Hotel chain made its rooms smoke-free in February, followed in March by Disneyland Resort in Anaheim, Calif. Other hotels have been steadily reducing their inventory of smoking rooms in recent years. "It's probably a precursor of what's to come," said Crow. "Given where we are as a country, the no-smoking laws that have been put in place, we'll probably see other chains jump on board." Marriott said its move is the largest in the industry, with more than 2,300 hotels and corporate apartments and nearly 400,000 guest rooms under the Marriott, JW Marriott, Ritz-Carlton, Renaissance, Courtyard, Residence Inn, SpringHill Suites, Fairfield Inn, TownePlace Suites and Marriott ExecuStay brands involved. The policy means that smoking will not be allowed in any guest rooms, restaurants, lounges, meeting rooms, public space or employee work areas. "Creating a smoke-free environment demonstrates a new level of service and care for our guests and associates," Chairman and Chief Executive J.W. 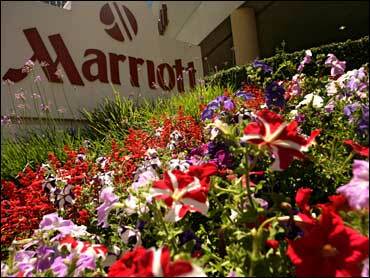 Marriott Jr. said in a statement. The company said that currently, more than 90 percent of Marriott guest rooms are already nonsmoking, and smoking is prohibited in many public spaces due to local laws. When Westin announced its decision to become smoke free, it said an average of 92 percent of its customers had been requesting nonsmoking rooms. The changeover cost the chain about $200 a room, mostly in costs associated with deep cleaning and treating hard surfaces, walls and carpets to eliminate allergens; replacing air filters, and cleaning air conditioning units. Crow noted that smoke-free hotels recover such costs through reduced maintenance expenses and that eliminating the nonsmoking option makes it easier to track the inventory of rooms.